I’m gonna be real honest with you for a second. Sometimes kids games bore me to tears. Seriously, one can only play Pretty, Pretty Princess so many times before going Manic, Manic Mommy. Once in a while, however, a kids game comes along that is so entertaining that I love it almost as much as the kids. Sum Swamp, by Learning Resources, is one of those rare games. 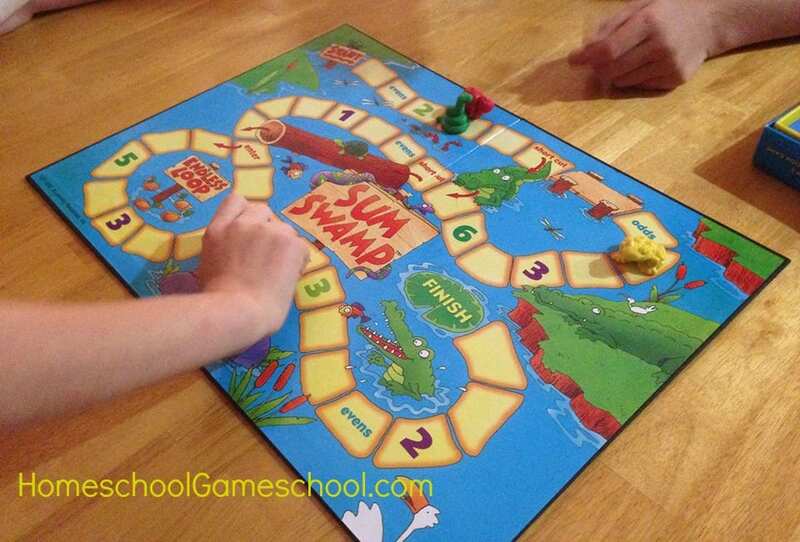 Sum Swamp features simple game play. Players roll three dice, two numbers (1-6) and a function (+ or -). The player arranges them big number, function, smaller number. If the player is correct the move ahead the number of the answer (for instance, 4-2 = 2, the player moves forward 2). Incorrect answers mean no forward movement. There are several hazard spaces on the board that will send you forward or backward depending on the result of a bonus roll & there are several shortcut spaces. Our favorite part of the game board is the “Endless Loop”, where you might want to be prepared to spend a fair amount of time. What Do My Children Learn When They Play Sum Swamp? Mental Math & Recall – Sum Swamp is the perfect choice to introduce children to doing math without paper and pencil. Speed drills – Sum Swamp isn’t a speed game, but the faster you can recall facts the faster you can play, and the faster the game the more fun it is! Turn taking – Patience is a virtue when your opponent has to do mental math! -Try throwing in an extra die or two for double digit addition and subtraction. -Try multiplying instead of adding. Math: Your child should be familiar with numbers 0-12 to play and play isn’t affected if you help your child count. Click here to see Sum Swamp on Amazon! My 9 year olds usually freeze at anything that involves moving at a faster pace, but I got the game & we played it- and it was fun for me too!